Korean OEM Samsung Electronics has unveiled and subsequently released a reincarnation of their 2014-released Samsung Galaxy J1 smartphone. The new Galaxy J1 Ace quietly went on sale in the Indian market during the weekend. We also told about the new and approved samsung “On” that will be making their way to the market soon. 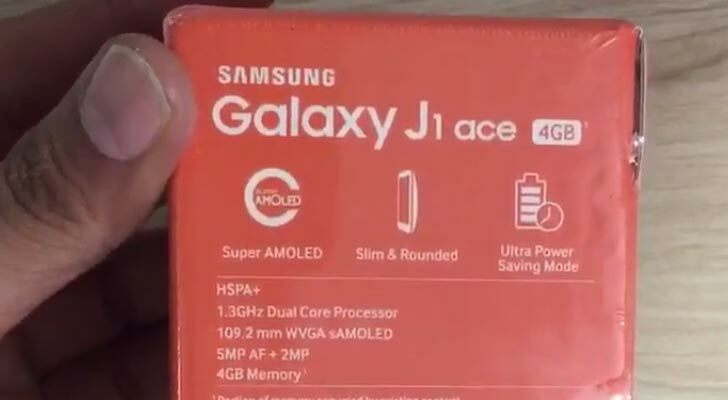 The Samsung Galaxy J1 Ace comes with a similar specs sheet compared to its predecessor; however, the new handset appears slightly larger in its 130.1 x 67.6 x 9.5 mm body. Samsung also updated the processor to an unnamed dual-core CPU running at 1.3GHz — up from the 1.2GHz one found on the regular J1 variant. In terms of display, the J1 Ace maintains the same size of 4.3″ WVGA touchscreen that you’ll find on the older model. The smartphone still runs on Android 4.4 KitKat but in the power department, the battery has been ever slightly shaved by 50mAh, leaving the device with 1,800mAh of energy juice. Finally, the handset still packs 512MB of RAM and 4GB of expandable storage while LTE connectivity was absent from the specs table once again. Money-wise, the Galaxy J1 Ace is available on the Samsung India website with a price tag of 6300 rupees. The price roughly translates to $95 USD using the current exchange rates. Back in February this year, Samsung announced an LTE equipped version of the model (Samsung Galaxy J1 4G) with a higher pricing in India. The J1 4G is also available in the United States as well as other foreign markets. See full Specs and price here.